A character reference, also known as a personal reference, is a recommendation provided by someone who knows you outside your workplace. Rather than speaking of your work experience and skills (as an employer might), personal references attest to your character and abilities. This type of recommendation showcases your personality and people skills. An employer might ask for a character reference in addition to other employment references. It is a way to learn a bit more about you and your character, particularly your character outside of work. You might also choose to submit a character reference to an employer in place of (or in addition to) a professional employment reference. This is a great way to make your job application stand out if you do not have a very strong employment background (for example, if you have not worked in a while, or if you are new to the job market). In a character reference, aspects of your personality are emphasized, including your trustworthiness, loyalty, and ethics, as opposed to your skills and experiences relating to a specific job. 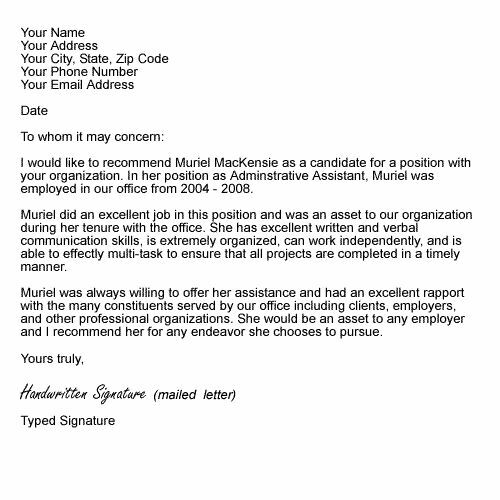 There are a number of occasions that one might need to write a professional quality character reference letter for a friend, associate, or even an employee. Certainly, the average person does not give much thought to the content of the letter or the structure of the letter. The fact is that the content and structure of the letter does matter. 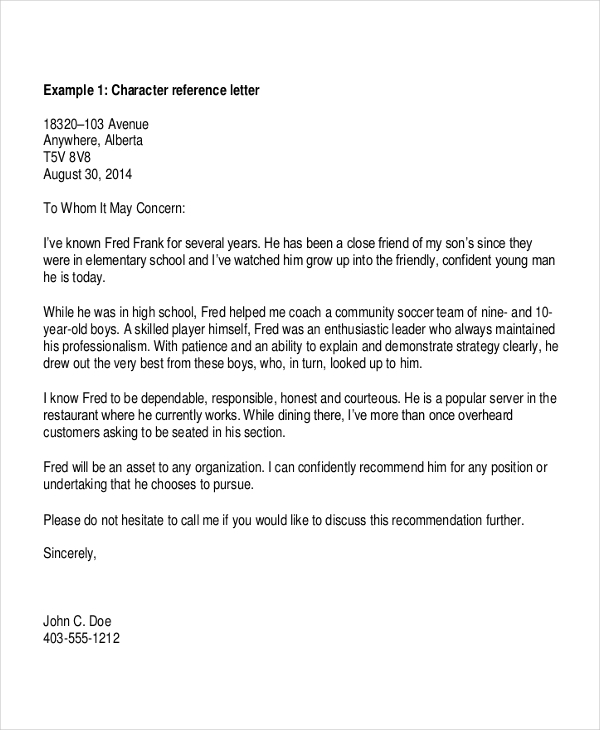 The character reference letter should look professional, include information required, and avoid including information that might prove defamatory to anyone because this could raise legal issues. Tips for Requesting a Character Reference: Think carefully about who you want to ask to write a reference for you. Make sure you pick someone who knows you well enough to offer insight into your personality. Pick someone who you think will speak positively about you. You can ask a family member, friend, or neighbor. You can also ask a teacher, advisor, volunteer leader, coach, pastor, or business acquaintance. 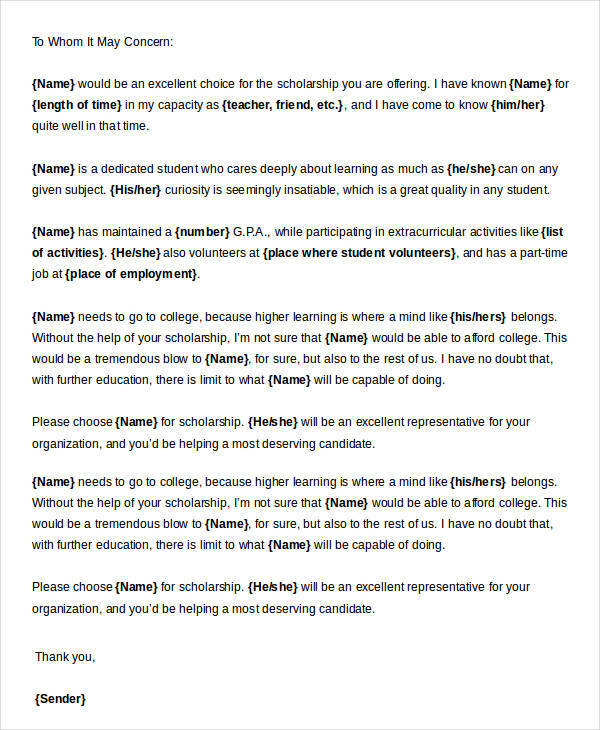 Be sure to ask your reference as early as possible, so she or he has time to write the letter. Offer to send them your resume or to update them on your life if they would like some more information, and make sure they understand the deadline by which their reference needs to be received. It’s also a good idea to provide them with a copy of the job postings you are applying for so that they can address how your character and personality make you a good candidate for these positions. Afterward, send them a thank you note to show your appreciation. First, state your relationship with the job candidate, and how long you have known him or her. The body of your letter should focus on one or two of the candidate’s strongest qualities or skills that you think will make them stand out in the job search. Try to support each claim you make about the person with a specific example. At the end of the letter, provide any contact information that you feel comfortable sharing with the employer. Be sure to meticulously edit your letter before sending it.You also want to make sure your letter is thorough, but not too long.Three to five paragraphs is enough – no more than one page. What is the different samples of character reference letter? 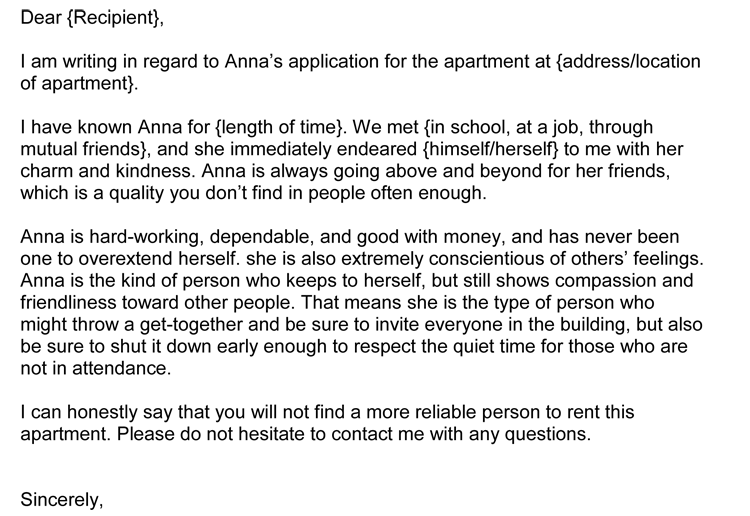 A character reference letter is usually written for you by someone you know outside of work. This can be a friend, neighbor or relative. It can also be a person with whom you have shared an experience, such as a teammate or a fellow volunteer. Also known as a personal reference or personal recommendation, a character reference documents your positive personal attributes. This type of reference is important for non-employment related pursuits ranging from memberships and awards to child custody and adoptions. 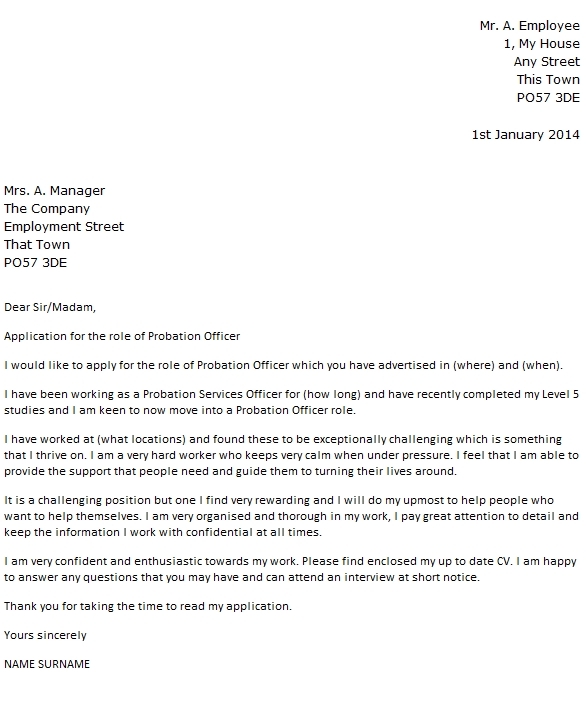 Character reference letters can also prove useful in landing jobs. With the advent of personal computers and printers and the widespread practice of networking, character references are more common than in the past. Nevertheless, they are more important than ever. Sell your friend by telling a short story: The character reference writer (friend, neighbor or relative) is at a disadvantage to the employment reference writer (supervisor) in several respects. He or she is not reporting on verifiable work history and is not carrying the authority of company letterhead. Most importantly, character letter writers are commonly assumed to “pump up” those they recommend. To offset these disadvantages, your character reference letter should provide evidence that your high opinion of the subject is valid. This is best done by recounting specific events concerning the person you are referring. 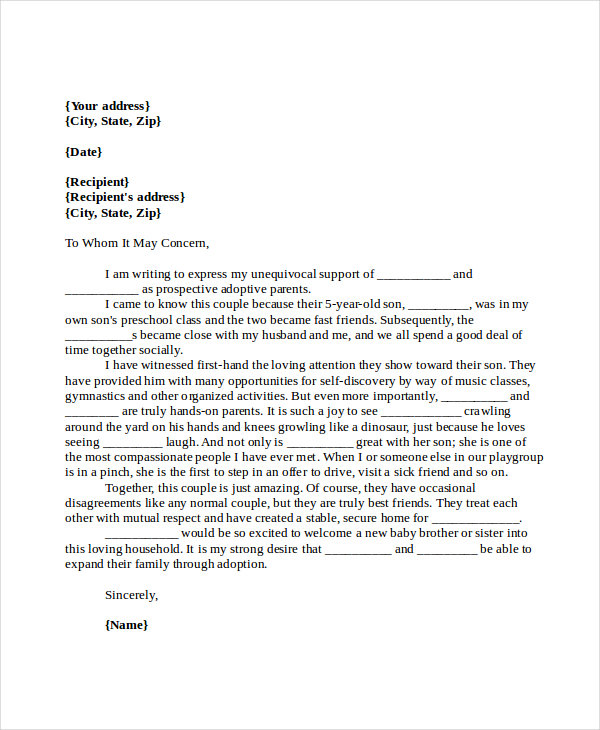 In essence, your letter should tell one or more short, believable stories that you know personally about the subject. The body should be a narrative that recounts 1 to 3 specific incidents regarding your friend or neighbor. The incidents should demonstrate his or her positive attributes. They should be examples of how he or she behaves. If you can’t say something nice: If you’ve been asked to write a letter to someone you’re uncomfortable recommending, it’s best to come up with an excuse for not doing so. If something must be written, construct a short letter basically containing only the introduction and closing sections. In other words, do not include examples of why the subject is worthy of the reference. 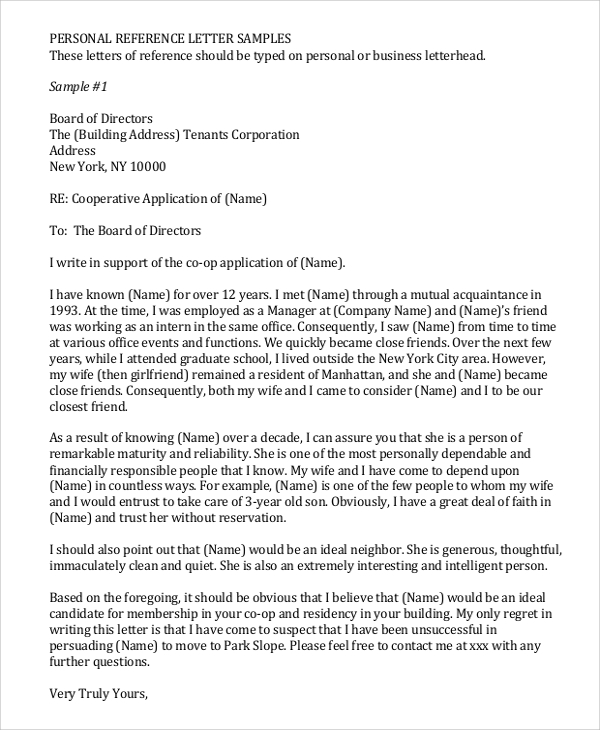 Non-Employment Related Letters: Sincere, thoughtful character reference letters can be essential to the success of a variety of non-employment related pursuits. 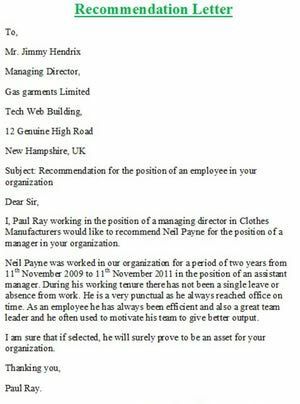 As far as how they are written, these types of references should be crafted in the same manner as job-related letters. They should be personal, straightforward, relatively informal, and positive. Writing Tips: These tips will help you understand how to write a character reference letter. However, keep in mind the strongest character letters are always personal and heartfelt. So the more you can write yours in your own words the better it will be. Organize your letter: As a rule, character references have three sections. Usually, a paragraph of only a sentence or two, the opening explains who you are and how you know the subject (the person you’re referring). The body is the majority of the letter. It can be several paragraphs. Here you make the case for your friend or relative– describing your experiences with him or her and giving examples of the subject’s good qualities. The last paragraph reinforces your belief in your friend or relative and contains your actual recommendation. Build your letter around specific traits: Identify your subject’s positive attributes. Then think of the traits that are important to the position, award, etc. he or she is seeking. Construct your letter around 1 to 3 of the attributes that overlap. For example, suppose the person you’re writing about is friendly, witty, honest, intelligent, hardworking, and reliable. Suppose also he or she is seeking a security guard’s job. A security guard should be, among other things, reliable and honest. So it’s best to build your letter around these qualities. Why we need a Character reference letter? A character reference is often required as part of the job application process, particularly for jobs requiring a high level of ethics and trustworthiness. Also, you may be asked to include character references as part of a school application, an application for certification, or membership within a professional organization. If you do not have a great employment record, you might add a character reference to your list of references. This can help boost your chances of making a good impression on the hiring manager. Unlike a job reference letter, a personal reference letter will speak more to your character than your skills in the workplace. Who Should Provide Your Character Reference? Character references can be provided by neighbors, business acquaintances, family friends, teachers, and clients. If you volunteer, a leader or other members of the organization can be used as personal references. Choose a reference who is up-to-date. Someone you’ve interacted with recently will provide a more meaningful letter than an acquaintance you haven’t seen in a decade. Choose people who know you well and think highly of you. This will help ensure that the letters are positive and personalized, and read sincerely. Be practical in making your reference request. Avoid asking friends who tend to be slow to respond to emails or phone calls. Select a diverse group. If you are asked to provide more than one reference, try to select a diverse group. For instance, you may want to include a friend who’s known you for years and can speak to your core personality and strengths. You might also choose a colleague who can speak about your on-the-job conduct and more work-related skills. Character Reference for a Colleague: If you need to write a character letter for a current or former co-worker employee, this is the right letter for you to use. Just click the image below to get started. 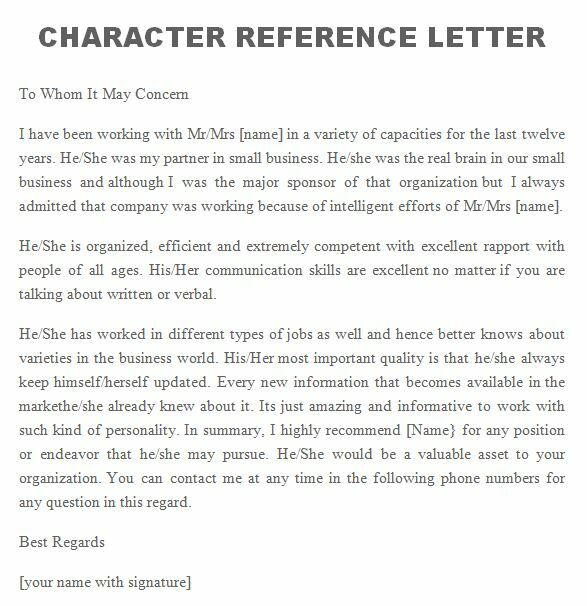 Character Reference for a Personal Contact: If you are asked to write a character reference on behalf of a personal contact, the letter below is the best option for you. It will work whether you’re writing a letter for a classmate, someone you met through a community organization, a teammate or anyone else with which you have a personal relationship. Click the image to download the document. Character Reference for a Student: If you’re a teacher who has been asked to write a character reference for a student, the letter template below is designed for your needs. Click the image below to access the document. Character Reference Letter: A character reference letter is usually written for you by someone you know outside of work. This can be a friend, neighbor or relative. It can also be a person with whom you have shared an experience, such as a teammate or a fellow volunteer. 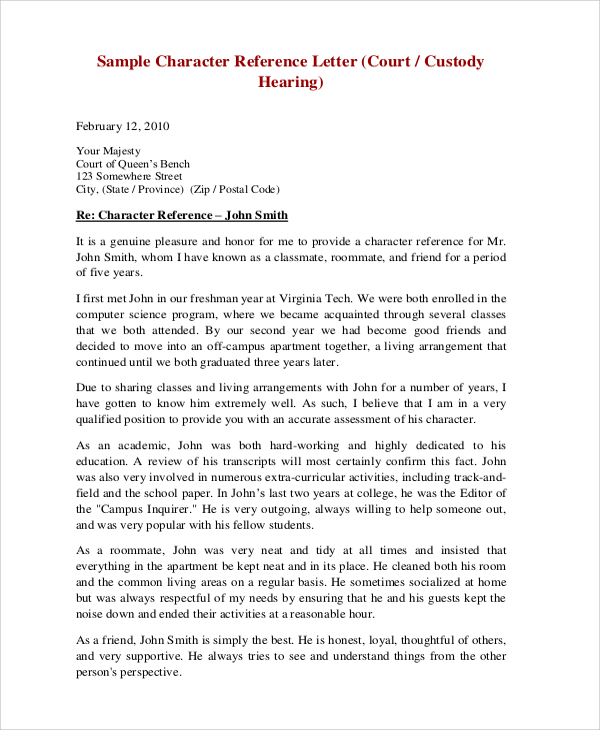 Character Reference Letter for Friend: Also known as a personal reference or personal recommendation, a character reference documents your positive personal attributes. This type of reference is important for non-employment related pursuits ranging from memberships and awards to child custody and adoptions. 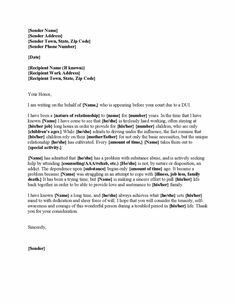 Elements of Quality Template: The fact is that most people are not professional character reference letter writers. They do not know the proper elements or features to add to the letter to make the people really take notice of the letter in a very positive way. Certainly, the best character reference template should include features that allow the writer to narrow down the topic and zero in on the skills that the applicant has for the position that they are applying for with the company. The letter should also focus on the type of skills and background that would match the position that is open with the company. Certainly, it is also important to offer a certain amount of praise for the candidate. A section should also include an area to place the contact information. 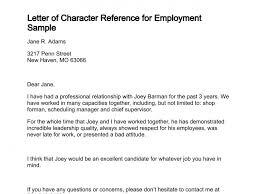 A few of the companies that receive the character reference letters prepared with the character reference template are probably going to contact the writer. 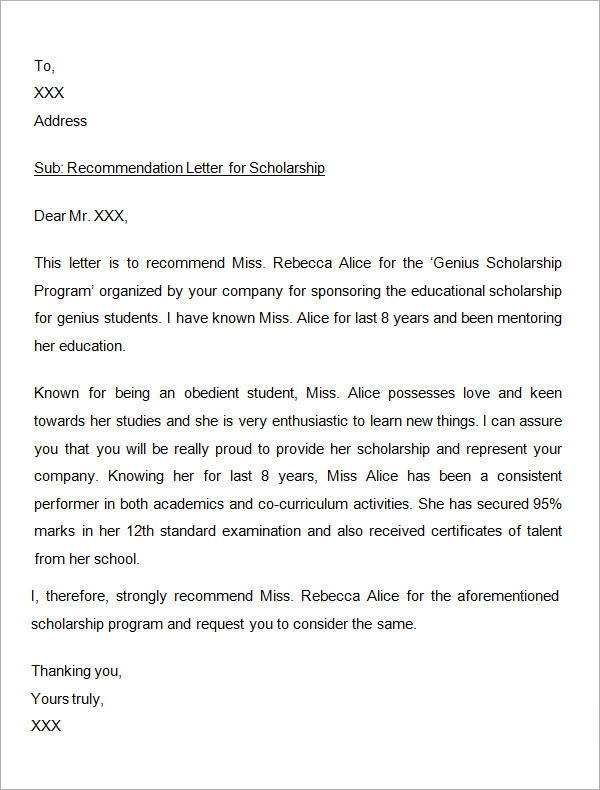 Certainly, it is due to the high quality of the professionally written reference letter. Consider the Implications: Any time you agree to provide a reference for someone, it’s important to consider the implications. The letter you write can help or hinder someone’s chances of accomplishing a goal can be very important to that person. Only accept if you can truthfully provide a positive, helpful reference and if you plan to honor your commitment. Once you have accepted, follow through with what you have promised to do and do so in a timely, professional manner. The fact is that most people are not professional character reference letter writers. They do not know the proper elements or features to add to the letter to make the people really take notice of the letter in a very positive way. Certainly, the best character reference template should include features that allow the writer to narrow down the topic and zero in on the skills that the applicant has for the position that they are applying for with the company. The letter should also focus on the type of skills and background that would match the position that is open with the company. Certainly, it is also important to offer a certain amount of praise for the candidate. A section should also include an area to place the contact information. 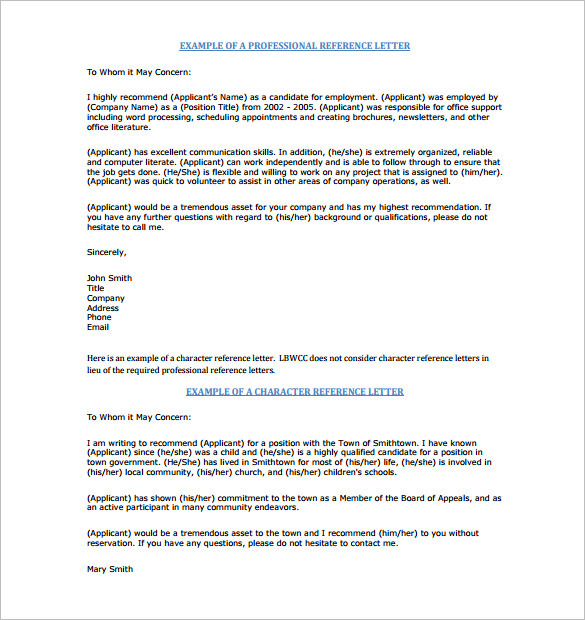 A few of the companies that receive the character reference letters prepared with the character reference template are probably going to contact the writer. Certainly, it is due to the high quality of the professionally written reference letter. Information on your personality and abilities, with examples. Details that match skills required for a position are ideal. This section can read something like, “Jen’s tact and sense of humor helped dissolve potential conflicts at neighborhood meetings and strengthen our community.” The letter should include specific examples of times when you conveyed certain skills and traits. Contact information. At the close of the letter, an email or phone number should be provided, in case the letter reader has follow-up questions. When you ask someone to be your personal reference, be sure to provide them with background on the position, so your reference can tailor the letter to the job.If you are asked to be a character reference for someone, read here for more tips on writing a strong character reference. How Should I Ask Someone for a Character Reference? Consider the method. The best way to request a character reference is by email because it gives the person time to consider their response. However, you might also ask for a character reference over the phone, or even in person. This makes sense especially if you are particularly close to the person. Phrase the question carefully. Rather than saying, “Can you write me a character reference,” ask the person, “Do you feel you can write me a strong character reference?” This will give the person an option to say “no” if they do not feel comfortable writing the reference for any reason. You only want strong recommendations, so this helps you avoid receiving any unenthusiastic references. Provide information. 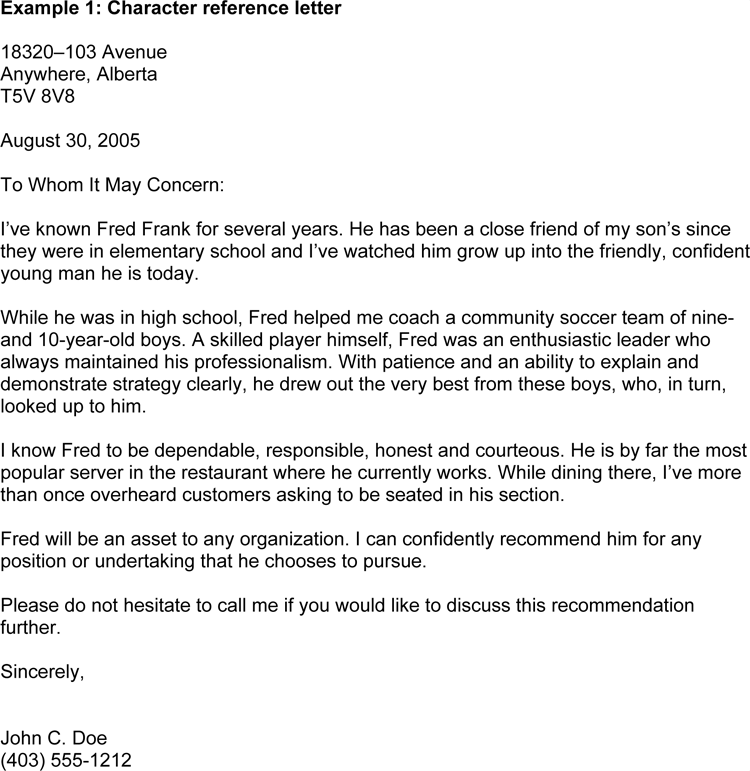 Give the person all the information they need to write you a reference letter. Tell them what job you are applying for, how to submit the letter and the deadline for submission. You might even include the job listing. Also send them any material that might help them write the letter, such as your resume. Send a thank you note. Send a thank you note afterward to the writer. Be sure to emphasize how much you appreciate them taking the time to write you a reference.